Is this new 256-gigabyte flash storage the SD card killer? MicroSD cards’ small size may make them tough to handle and easy to lose, but Samsung just fit 256 gigabytes of flash storage in a card just as small — that’s the size of the hard drive in the entry-level MacBook packed into a device about as big as your thumbnail. The cards are the world’s first removable Universal Flash Storage (UFS), and Samsung says they boast performance that’s five times faster than the best MicroSD. Flash-storage technology is a faster way to access files over traditional hard drives and storage devices, and while there are some cameras with built-in flash, Samsung’s latest cards are the first to feature the speed of flash in a removable device. With the resolution of cameras on the rise and 360-degree video slowly creeping into the consumer market, that speed (and high capacity) could be in high demand for cameras as well as smartphones. The UFS cards, available in sizes from 32GB to 256GB, have speedy read speeds of up to 530 megabytes per second, which sits about five times higher than the UHS-1 MicroSD cards, the previous speed champs for tiny storage. Samsung says a 5GB HD video will preview in about ten seconds, compared to about 50 on a fast MicroSD. Consumers (and pros) may have to wait a bit though before they actually see the cards in action — while UFS is about the size of a MicroSD, the metal contacts on the back are different, suggesting they might not be compatible with current MicroSD devices. 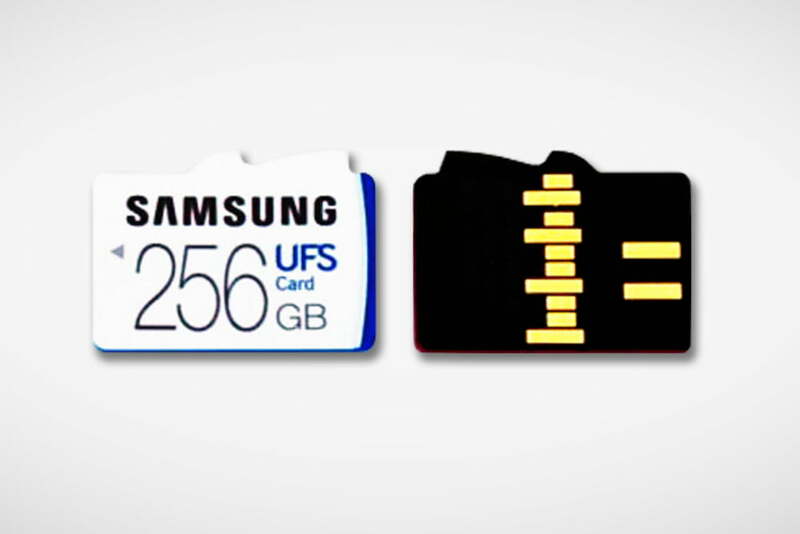 While MicroSD cards have the metal contacts on the top edge, Samsung’s UFS also have an array of them in the middle. Last year, Samsung was also the first to introduce built-in UFS chips inside their Galaxy phones, and expanded that capacity to 256GB earlier this year.